Let the windows down as you approach the car. The heat escapes before you get in. No need to get back into the car to let the windows up. Put the top up and walk away. 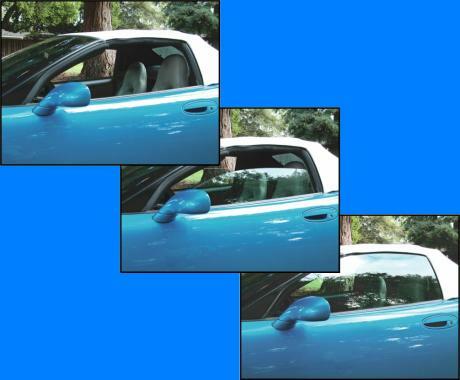 Convertible owners know all too well what this means. Don't leave the windows down just because the car is on a racing trailer. Climb out, raise the windows, secure the car. Tight garages are no longer a problem. It's much easier to get into the car after lowering the windows. Control both windows from the key FOB! Have the stock radio power-up when you approach the car. Listen to music as you take the top out, access the trunk, or let the heat escape. You pull the ignition key and open the door. There's no need for the radio to stop; you're still in the car. The music resumes and stays on until you lock or unlock the doors with the remote. If you forget, the Window Valet™ will shutdown the power for you. The passenger is waiting in the car, but you need the keys to get into the house. No problem. The passenger presses a few keys on the D.I.C. and viola! accessory is now available for the radio and windows. Radio on, no key; and you can do this with both doors open. Aftermarket stereo also requires the Accessory Valet™. Eliminate passenger frustration when dropping someone off. Have the doors unlock before they pull the handle. 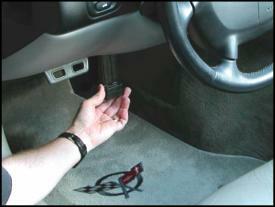 Set the hand brake or put the transmission in park and the doors unlock. You pick the configuration or not at all. Notice the door unlocks when placed in park. Record the vehicle high speed as you drive. Display it on the speedometer later with a few button presses on the D.I.C. You can finally find out how fast the Valet Guy drove your car; just be sure to clear the old high speed before handing him the keys. 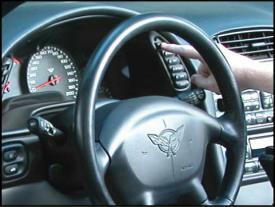 Shows high speed right on the speedometer. OK, how about installation? It must be tricky to get access to so many features. It is tricky, but Top Down Tech has done all the work. The magic is in the software that runs inside the Window Valet™. All you have to do is plug it in, choose your features, and enjoy the benefits! The Window Valet™ uses the OBD-II port to communicate with your C5. Press buttons on the D.I.C. to configure the Window Valet™. © 2000-2015, Top Down Technologies, Inc. All rights reserved.